Can you briefly describe how you handle the typical objection of "send me some information." This is a very common sales objection and one that sales people come against when selling and when making sales appointments. There are two actions you can take to overcome send me some information objections. The first step in overcoming the sales objection; Send me some information, is to establish whether it's a real sales objection or a smoke screen. Often it's a smoke screen and occurs because we haven't grabbed the buyer's attention earlier in the sales stages. Think about it, have you used it to get rid of a telesales caller. If they had given you a really good Reason for the call that got you listening you wouldn't have used the objection. So if you often get the sales objection of; Send me some information, look at your Sales Introduction or your Sales Appointment Calls and see if there is something you can add to grab the buyer's attention and stop any smoke screen objections. When you get this objection during a telesales call or a face to face sale, and you think it's a smoke screen, go back to the Questioning stage of the sale and find out what the buyer really wants. Overcoming a real sales objection. When this is a real Sales objection and the customer genuinely wants more information you need to define why. Why they want information, and then give them something that meets that need now. If they want information because they want to see supporting evidence about what you have presented, then you need to show that evidence now. Face to face salespeople could show written evidence that meets that need. Telesales or sales appointment makers could direct the prospect to a webpage and talk them through it. If the objection comes up early in the call then it's a brush off, a smoke screen, a way of saying, I'm not interested in what you're selling. That doesn't mean the sales dead. It means you quickliy have to come up with a way of getting that prospect interested in you and the possible benefits they could gain. I would always answer the objection with a question. In an early objection ask for details of the information they want. If it's a smoke screen they can't tell you. If it's a real objection they will tell you and you can take it from there. There is no magic answer that will overcome any sales obejction. If there was sales people wouldn't be paid so well, and we wouldn't need sales training. The way to handle all sales obejctions is to have a sales process. A path you follow that works for you. You can see the process I use for obejction handling with my working sales teams. 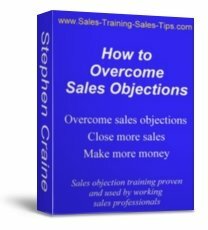 Open How to Handle Sales Objections or click the image. You'll find information on a professional way to handle sales objections. How do you handle the objection: Send me information? Share your answers to this objection. Give us your opinion. Add a comment. Ask a question. Write an article, a few lines or a full page. Click the comments link below and simply type in the box.